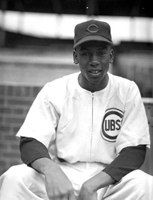 During his career Ernie Banks showed that he was one of the greatest baseball players ever to put on a uniform. He broke the 500-home run barrier and ended his career with 512 homers. 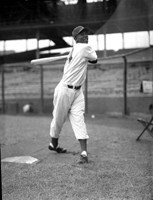 He had a career batting average of .274 and earned 2,583 hits overall. He also notched up 1,636 RBI. 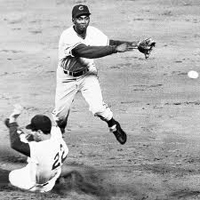 He played his entire career, from 1953 until his retirement in 1971, with the Chicago Cubs - a team notorious for its bad luck and losing ways. Despite that, Banks notched 14 All Star game appearances. He also had a Golden Glove and was twice named the National League MVP. 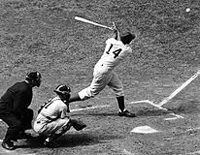 He won the Lou Gehrig Award in 1967 and had his number, 14, retired by the Chicago Cubs. These days Ernie Banks can still be found by fans attending Cubs games at Wrigley Field. In 2006 he was also a part of a group of people who were interested in buying the Cubs from the Tribune Company. It shows that he still loves the team where he spent his entire career and remains a beloved fixture for fans. Ernie Banks is also known for his generosity. He is as legendary for giving back to the community as he was for his prowess on the baseball field. Not too long ago Banks lent his time and talents to the Live Above and Beyond Foundation http://www.erniebanksliveaboveandbeyond.com/main/ . The goals for the foundation are lofty, to say the least. Their stated goals are to completely eliminate prejudice and to support programs that enhance neighborhoods that are in crisis and to destroy prejudice and discrimination wherever it may be. Ernie Banks is known for donating signed memorabilia and his time and efforts to charities across Chicago and throughout the country. The foundation, in 2008, released a series of fine wines known as the Ernie Banks 512 Chardonnay where all proceeds earned from the sale of the wines was donated to his foundation and filtered out to a variety of charities across the country. The number, of course,is a nod to his career amount of home runs. These days, running his foundation takes up the bulk of Banks’ time. He is not one to rest on hislaurels and rake in the praise and adoration from fans. Banks has always been a dedicated worker and that continues well into his retirement. Despite being in his 80s now, Ernie Banks continues to give back and he does that through a charity foundation that he created. He still wants to play two, but now he wants to make sure that by doing so the money goes where it is needed the most and that the world will truly be a better place because of his efforts.